Poised to set the world on fire, the members of New York City pop band Fun., whose sophomore album, Some Nights, drops Feb. 21, have already decided what they stand for: equality — and will take that message to their fans and the media as they continue to rise in popularity. 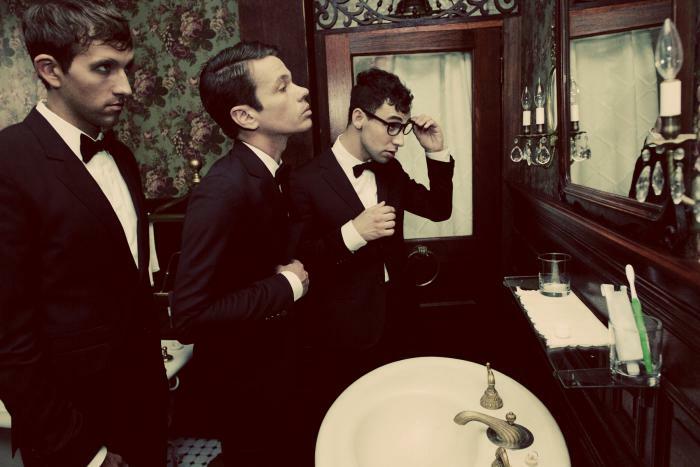 “We’re pretty serious on gay rights,” guitarist Jack Antonoff told samaritanmag.com recently, while in Toronto with his bandmates, Nate Ruess and multi-instrumentalist Andrew Dost, to promote their new album. “That’s our thing because we’re all straight and we get asked all the time if we’re gay, which is really offensive in itself, the assumption that you have to be gay to care. For their part, the three members of Fun. have aligned themselves with Montreal-based Revel & Riot, whose objective is to promote lesbian, gay, bi-sexual, trans-gendered, and queer and/or questioning (LGBTQ) rights, awareness and equality through new media, graphics, writing, and products on the internet. “Revel & Riot are a really cool company whose specific goal is to just be activists in general and a great news source and really spread a lot of great information, but one of their goals, which is really inspiring to us, is rebranding the whole concept of queer and taking away a lot of the stigma from the ‘70s and ‘80s when we didn’t have the information that we do now and there was a lot more homophobia. Fun did a T-shirt for Revel & Riot emblazoned with the line “IT’S ALL FUN. 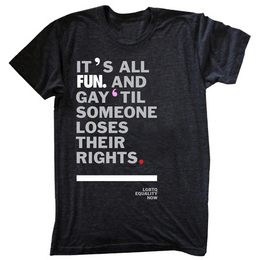 AND GAY ‘TIL SOMEONE LOSES THEIR RIGHTS’ — a play on mom’s warning to you as a kid if you were playing too rough (“it’s all fun and games until someone loses an eye”) —and under the phrase, in small print, it says “LGBTQ EQUALITY NOW.” The T-shirts sell for $15 online, through Revel & Riot as well as Fun.’s record label, Fueled by Ramen. “We’re going to bring out more shirts and more literature out on this tour,” adds Dost. Fun. is on the road throughout North America from Feb. 21 until May 28.